Fame and fortune are hard won in the world of small and independent publishing. The nights are long and filled with editing, the money, so hard to come by, seems to melt the moment you find it. But at the end of the day, seeing a page in print is a beautiful thing – despite the errata. Everyone working in publishing understands this, and understands what it means to finally have your work recognised. For the past four years The Stack Awards, organised by Stack Magazines, have sought out the most exciting and inspiring independent magazines. The night of the award ceremony is among the highlights of the year for many magazine makers. The chance to have their work celebrated by the panel of expert judges, and prizes presented in front of an audience of some of the biggest names in the industry. Despite the premodifiers, the small and independent magazine industry is anything but. This year the winners were chosen from around 400 entries from 23 countries, representing the collaborative work of hundreds of international editors, designers, writers, photographers, models, printers, fundraisers and all sorts of other contributors. As well as recognising recent work the awards also look to the future. With new talents placed alongside older established titles, past winners have gone on to do great things, and the awards, arguably, have set quite a few trends. 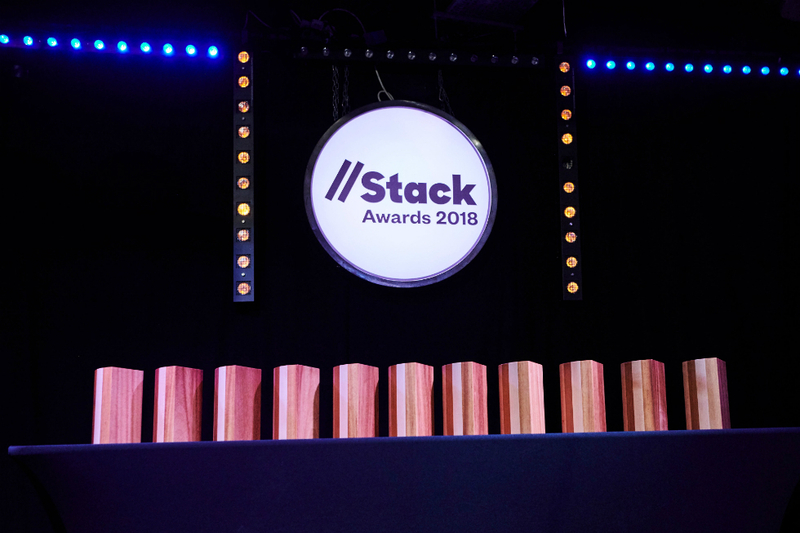 If you’re looking to find something new, or as a gift, or you’re thinking of getting into publishing yourself, it’s worth paying close attention to The Stack Awards. This year saw the list topped by New York-based broadsheet paper, founded by former Dazed & Confused editor Rod Stanley and infamous art director Richard Turley. 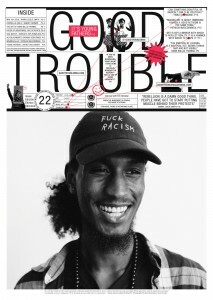 The New York Times Magazine’s Gail Bichler and Jeremy Leslie of magCulture were looking for magazines that presented a “strong and clear” editorial concept, which Good Trouble certainly delivers. Since 2016 the magazine has been publishing stories of resistance and rebellion at “the intersection of arts and culture with politics and protest”. They match this incisive editorial angle with a chaotically neutral design, courtesy of Turley, where text sometimes aligns to the grid, but more often than not flies about the page like a hurled molotov cocktail. A screaming mouth and bold black title emerging from the gloom announced the launch of Suspira in April this year. The magazine must have made a deep impression on judges Steven Gregor and design duo Malte and Urs, who named it the Launch of the Year. In its own words, Suspira “dissects sinister subjects”, for the first issue turning their illustration, reviews, photography, and non-fiction apparatus towards ‘The Monster’. If Suspira puts you in mind of another magazine, it’s because editor Valentina Egoavil Medina is a contributor to Sabat, while Elisabeth Krohn, that publication’s founder, here serves as editorial advisor. This is a magazine to keep a watchful eye on. One well positioned to explore the recent popular revival of the gothic, the esoteric, and the occult. Their next issue, Suspira II: The Fetish Issue is out soon. From a strong field, The Skirt Chronicles was selected by judges Christoph Amend, editor-in-chief of ZEITmagazin, and Monocle 24’s producer Tom Edwards to scoop Editor of the Year. The prize is awarded to the magazine as a whole, which is very fortunate as three editors, Sarah de Mavaleix, Sofia Nebiolo and Haydée Touitou, share the day-to-day work of “celebrating diverse cultures and generations”. While reflecting a “feminine voice”, the magazine aims not to exclude anyone. Through three volumes The Skirt Chronicles has told the stories of the sartorial revolution of May ‘68, the revitalisation of Vogue by Joan Juliet Buck, and Jorge de Cascante on judging books by their covers alongside numerous well-curated fashion shoots. 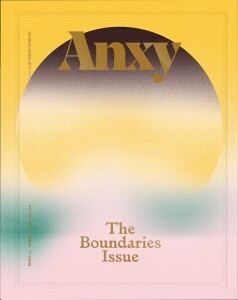 This year, mental health magazine Anxy were the proud winners of two prizes: Debbie Millman, brand consultant and podcaster, and Will Hudson, founder of It’s Nice That awarded the magazine Art Director of the Year, while Jon Cockley, founder of Handsome Frank, and Tate’s book buyer Simon Armstrong thought that Anxy’s second issue on workaholism deserved Best Use of Illustration. This double award builds on their successes at last year’s Stack Awards, where they were awarded both Launch of the Year and Stack Subscribers’ Choice. As we all know, the creative industries are unforgiving; it’s perhaps no surprise then that this publication’s sensitive, often humorous, and always beautifully designed pages are so well-appreciated. 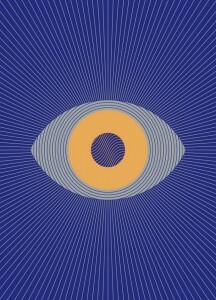 Eye on Design only appeared in print early this year, being published by the team behind the essential graphic design website, AIGA: Eye on Design. The mesmerising, eye-focused cutout design of their second ‘PSYCH’ issue made a bold impression, and captured the attention of judges Steven Heller, former art-director of the New York Times Book Review, and Jaap Biemans, the founder of coverjunkie. Inside, printed in DayGlo ink, optical illusions abound, creative practitioners produce designs “under the influence”, and Mark Wilson interviews scientists to find the precise recipe of pop-psychology, branding and packaging used to trigger food cravings. While the cover won the award, it’s well worth diving into this issue. 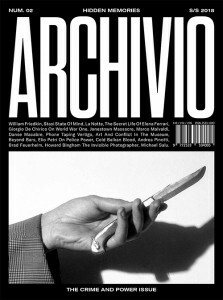 Turin-based Archivio won best use of photography for their second issue. The prize having been judged by Ben Hillwood-Harris of Artwords bookshop, and Clare Grafik, Head of Exhibitions at the Photographers’ Gallery, London. For my money, the ambiguous cover image of the hand and knife would win it alone – is it pointed in anger or being passed to someone? Archivio’s unusual approach is to take its pictures from existing archives before weaving stories around them. In this issue, photographs taken from the Stasi archives feature secret agents performing hand-to-hand combat, their identities hidden by simple scrawled marker pen. In another story, Andrea Pinotti writes about the three dimensional nature of images via a set of photographs taken from a 1978 study of the Turin Shroud. Another winning debut publication, Nataal focuses on people who are “building diverse narratives in and about the spirit of Africa”. Judges Rob Alderson, editor at WeTransfer and Mike Dang, editor-in-chief of Longreads, awarded the prize to the feature Versage by writer and photographer Allyn Gaestel which investigates the culture of knock-off designs, the notion of cheapness, and global inequality by focusing on how bootleg brands, like ‘Versage’, have developed a life of their own in Lagos, Nigeria. As a media and consultancy brand, Nataal has over the past few years run a number of exhibitions and events. Their attention to quality and detail continues in their print magazine, publishing biannually; with nearly 350 large format pages, beautiful glossy photography and, of course, informative features, Nataal is one to watch. Ecotone publishes art and writing that “reimagines places”, a theme to be interpreted as openly as is possible. This prize is awarded to a single piece in the submitted issue. 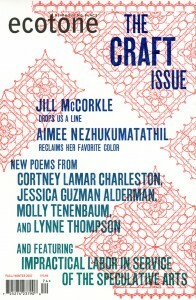 Together, novelist Evie Wyld and Granta’s Luke Neima chose The Lineman by Jill McCorkle, published in in issue 24. The Lineman follows a divorced father caught between caring for his wild teenage daughter and his slowly dying mother. The magazine is produced by the faculty and students of the MFA program at UNC Wilmington, with former contributors having gone on to win Pulitzer Prizes and become MacArthur and Guggenheim fellows. So while the judges have to pick one story, we can enjoy the rest of the magazine – an excellent publication for discovering new literary talent. The bilingual magazine set up by the students at the University of Applied Sciences and Arts in Hanover (not Brazil!) picked up the Student Magazine of the Year, awarded by judges author Ruth Jamieson and lecturer Angharad Lewis. Brasilia has previously covered neighbours, doubt, and waiting, their latest issue considers trash – how much is too much? A pertinent question explored through photographs, interviews, and comics. Inside the issue, fashion designer Claudia Bumb takes a look at the impact of microplastics, photographer Christian Werner tells the stories of the children growing up in the war-ruined cities of Iraq, and Stefan Finger produces a photo documentary on the landfill scavengers of the Philippines. Coincidentally, the typeface used throughout the issue, designed by Bruta Types, is named Trash. The simple, but admirable aim of Perdiz – yet more bilingualism – is to present “the things that make people happy”. Evidently it does so, as the subscribers of Stack Magazines voted it the Subscribers’ Choice. Clearly, amidst all the politics and intrigue people also like to smile, and with pastel hues, textural objects, and the motto “happiness is contagious” it’s hard not to. The magazine has been bringing joy to people since 2013. But happiness is variable, and alongside stories of the beauty of bad art and the joy of beekeeping, you read those of finding love in the apocalypse and a woman turned on by the Eiffel Tower – nobody said happiness was simple.